Quantum Monte Carlo methods are a powerful suite of techniques for solving the quantum many-body problem. By using random numbers to stochastically sample quantum properties, QMC methods are capable of studying low-temperature quantum systems well beyond the reach of conventional deterministic techniques. QMC techniques have likewise been indispensible tools for augmenting our current knowledge of superfluidity and superconductivity. 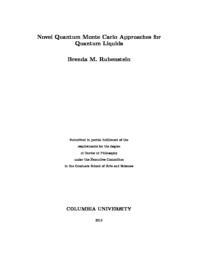 In this thesis, I present two new quantum Monte Carlo techniques, the Monte Carlo Power Method and Bose-Fermi Auxiliary-Field Quantum Monte Carlo, and apply previously developed Path Integral Monte Carlo methods to explore two new phases of quantum hard spheres and hydrogen. I lay the foundation for a subsequent description of my research by first reviewing the physics of quantum liquids in Chapter One and the mathematics behind Quantum Monte Carlo algorithms in Chapter Two. I then discuss the Monte Carlo Power Method, a stochastic way of computing the first several extremal eigenvalues of a matrix too memory-intensive to be stored and therefore diagonalized. As an illustration of the technique, I demonstrate how it can be used to determine the second eigenvalues of the transition matrices of several popular Monte Carlo algorithms. This information may be used to quantify how rapidly a Monte Carlo algorithm is converging to the equilibrium probability distribution it is sampling. I next present the Bose-Fermi Auxiliary-Field Quantum Monte Carlo algorithm. This algorithm generalizes the well-known Auxiliary-Field Quantum Monte Carlo algorithm for fermions to bosons and Bose-Fermi mixtures. Despite some shortcomings, the Bose-Fermi Auxiliary-Field Quantum Monte Carlo algorithm represents the first exact technique capable of studying Bose-Fermi mixtures of any size in any dimension. In Chapter Six, I describe a new Constant Stress Path Integral Monte Carlo algorithm for the study of quantum mechanical systems under high pressures. While the eventual hope is to apply this algorithm to the exploration of yet unidentified high-pressure, low-temperature phases of hydrogen, I employ this algorithm to determine whether or not quantum hard spheres can form a low-temperature bcc solid if exchange is not taken into account. In the final chapter of this thesis, I use Path Integral Monte Carlo once again to explore whether glassy para-hydrogen exhibits superfluidity. Physicists have long searched for ways to coax hydrogen into becoming a superfluid. I present evidence that, while glassy hydrogen does not crystallize at the temperatures at which hydrogen might become a superfluid, it nevertheless does not exhibit superfluidity. This is because the average binding energy per p-H2 molecule poses a severe barrier to exchange regardless of whether the system is crystalline. All in all, this work extends the reach of Quantum Monte Carlo methods to new systems and brings the power of existing methods to bear on new problems.